Wow - I don't think things have slowed down any from Christmas yet! Craziness! We had the BEST Christmas EVER! Definitely because Mia was now with us. We have been "waiting" for her the last two Christmas season's - and it was PURE JOY to have her here. She was so sweet - opening so many presents and being in awe over what to touch first. Macy of course LOVED being able to not only open her own gifts - but to help her little sister open hers too! Then Macy turned 5 on January 7th! Ahhhh! My little baby girl is getting so big! We had originally gotten a trampoline for the girls for Christmas...but we were way too busy to put it together...so we saved it for the big birthday. 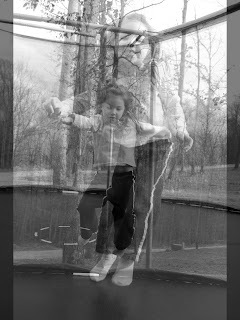 I love this layered picture I made of the jumping girl! Mia can say ma ma, daddy, moo, arf arf, please (ta), thank you (chk chu), mamaw (mam), pa, and if she doesn't have a word - she will just scream and wave her arms to communicate! Her first word she learned when she had been home only one month was "kitty kitty" (did did did) - calling the cats! Soooooo sweet. This has been a GREAT 8 months with little Mia! Love the updates. Happy 5th birthday to Macy! Miss Mia is adorable as always. Happy Birthday Macy! I can't get over how much Mia has changed! She is a beautiful little girl! She and Faith have a very similar vocabulary, only kitty is meeow mow meeow mow! Faith has also gotten used to screaming for things too! There may be a reason the two of them shared a crib! We miss you all! give the girls a hug and kiss from us! Hi Glenda! Katie Joy got the same Dora jammies for Christmas! Sooo cute. Always love to find updates on your blog! Hope to see you soon!